The increasing demand of diodes, capacitors, inductors, resistors and other microelectronic components is driving the market demand. Growing penetration of smartphones, TV, computers, tablets, laptops, and others are also contributing the market growth. Growing adoption in solar cells, photovoltaic paneling, and other solar applications are further boosting the market growth. Rising environmental concern followed by favorable governmental support to promote solar devices is again pushing the market growth high. The latest report by Value Market Research expects the Global Monocrystalline Silicone Furnace Market to reach USD 210 million by 2025. It was valued USD 295.5 million in 2018. The report foresees a 5% CAGR from 2019 to 2025. On the basis of product, the Czochralski (CZ) method furnace led the segment in the year 2018. Czochralski furnace offers pure silicone with high production speed, excellent thermal resistance at a relatively lesser cost is driving the market growth. Also, increasing demand for TV, smartphones, laptops, tablets, computers and other electronic and semiconductor devices are driving the market growth. By application, semiconductor led the segment and accounted for maximum share in 2018. Robust demand for smartphones, laptop, consumer appliance, and other electronic gadgets is driving the market growth. Rapid integration of IoT based services is further fueling up the demand for semiconductors. Geographically, Asia Pacific dominated the regional market in 2018 owing to booming electronics industries in countries such as China, India, Taiwan, Korea, and Japan. Also, favorable government policies for a reduction of carbon footprints and promoting the adoption of solar panels further boost the regional market growth. Major players of the market are Cyberstar, Ferrotec, Gigamat, Kayex-Lintoncrystal, Mitsubishi electric, MTI Corp, PVA TePla AG, Tanlong Photoelectric- (Jiangsu Huasheng Tianlong Photoelectric Co., Ltd.) and Wanquan Jingyi Machne Tool Co. Ltd.
As per this study the Global Monocrystalline Silicon Furnace Market was valued USD 210 MN (by revenue) in 2018 and is anticipated to reach USD 295.5 MN by 2025 with a CAGR of 5%. Monocrystalline silicon furnace is the equipment used for producing single crystal silicon (mono Si) either by czochralski method or floating zone method. This furnace delivers low cost silicone that is widely used in electronic and solar application. The monocrystalline silicon derived is used in silicon wafers, silicon chips, and photovoltaic paneling. Rising demand for smartphones, tablets, laptops, wearable electronic gadgets and other commercial and home appliances is driving market growth. 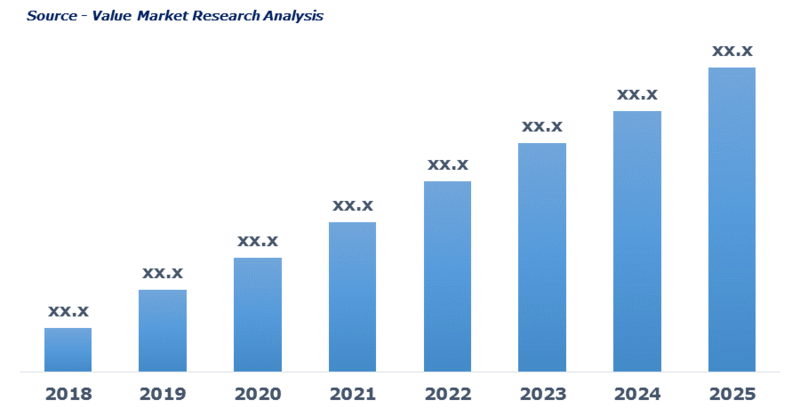 Rising usage of silicon wafers in semiconductor, sensors, detectors, solar cell, and other applications is fueling the market growth. The high efficiency of monocrystalline silicone has generated its demand for solar application. On the flip side, the high cost of the equipment is likely to hamper the market growth. This detailed market study is centered on the data obtained from multiple sources and is analyzed using numerous tools including porter’s five forces analysis, market attractiveness analysis and value chain analysis. These tools are employed to gain insights of the potential value of the market facilitating the business strategists with the latest growth opportunities. Additionally, these tools also provide a detailed analysis of each application/product segment in the global market of monocrystalline silicone furnace. The broad monocrystalline silicon furnace market has been sub-grouped into product and application. The report studies these subsets with respect to the geographical segmentation. The strategists can gain a detailed insight and devise appropriate strategies to target specific market. This detail will lead to a focused approach leading to identification of better opportunities. Furthermore, the report comprises of the geographical segmentation, which mainly focuses on current and forecast demand for monocrystalline silicon furnace in North America, Europe, Asia Pacific, Latin America, and Middle East & Africa. The report further focuses on demand for individual application segments in all the regions. The report also covers detailed competitive landscape including company profiles of key players operating in the global market. The key players in the monocrystalline silicon furnace market include Cyberstar, Ferrotec, Gigamat, Kayex-Lintoncrystal, Mitsubishi electric, MTI Corp, PVA TePla AG, Tanlong Photoelectric- (Jiangsu Huasheng Tianlong Photoelectric Co., Ltd.) and Wanquan Jingyi Machne Tool Co. Ltd. among others. An in-depth view of the competitive outlook includes future capacities, key mergers & acquisitions, financial overview, partnerships, collaborations, new product launches, new product developments and other developments with information in terms of H.Q. Wanquan Jingyi Machne Tool Co. Ltd.